Word’s AutoCorrect feature automatically replaces the text you type with text that Word thinks you mean. AutoCorrect will correct typos and will also insert special characters not found on the keyboard. A common example of a typo is “teh”. If you type “teh” in Word (and the AutoCorrect options retain their default settings) it will be replaced with “the”, which will be what you want, nine times out of ten. On the other hand, an example of a special character not found on the keyboard is the copyright symbol. By default, if you type “(c)”, Word will replace your text with “©”. These are both examples of AutoCorrect in action. As you continue to use Microsoft Word, you may build up a large collection of AutoCorrect entries that you find useful. The details about these entries are held in a file stored on your computer. It stands to reason that you will not have access to the same AutoCorrect entries if you have to use a different computer. This can pose a problem if, for example, you get a new PC at work. Actually, it needn’t pose a problem because it is quite easy to move AutoCorrect entries in Word to a new computer. The key is knowing in which file your autocorrections are stored: you can then transfer this file to the new computer. find the .acl files on the source computer and copy them to an intermediate location. A good example would be a USB memory stick, but you could also email them to yourself, for example. As long as the intermediate location is accessible by both the source and destination computers, there is no problem. locate the .acl files on the destination machine, and, just to be safe, rename them out of the way. If anything goes wrong, you can then reinstate them. 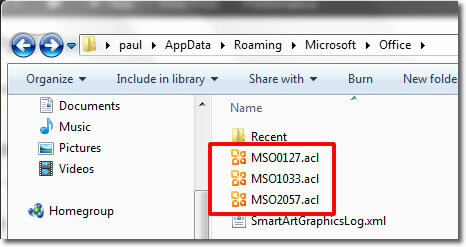 copy the .acl files from the intermediate location to the new computer. When you start Word on the new computer, the transferred AutoCorrect entries will be in effect.